What is the Holtermann Collection? The Holtermann Collection is one of the world’s unique photographic records capturing a generation of people, from every corner of the globe and almost every walk of life, caught up in the social and environmental upheaval that was the Australian gold rush. The collection also includes the world’s largest wet plate negatives, including two measuring a massive 1.35 x 0.94 metres, which together make up a huge panoramic photograph of Sydney Harbour taken in 1875. The Holtermann Collection was the brainchild of German migrant prospector Bernhardt Otto Holtermann (1838-1885) who, in the summer of 1870-71, struck it rich on the NSW goldfields at Hill End. On one amazing day, 19 October 1872, the world’s large specimen of reef gold – a huge 630 pound (153 kilograms) mass of metal – was found in Holtermann’s mine, making the man and his nugget famous overnight. The gold miner quickly commissioned itinerant photographer Beaufoy Merlin to photograph the nugget before it was sent to be crushed. This meeting led to one of the most astonishing photographic partnerships ever undertaken. In January 1873, the two proud migrants announced their plans to promote the amazing potential of their adopted country to the world through photography – billed as Holtermann’s great International Travelling Exposition. Beaufoy Merlin had begun his photographic career in Victoria in 1866, later forming the American and Australasian Photographic Company (A&A Photographic Company) with a young Charles Bayliss. By the time the two photographers arrived in Sydney, in September 1870, they had already completed an extraordinary documentation of “almost every house in Melbourne, and the other towns in Victoria.” They had also developed a unique style of outdoor photography, introducing people into their streetscape photographs by capturing all who chose to stand outside a building or just happened to be passing by, to create a complete and life-like portrait of people and places. With the new gold rushes of 1872, Merlin and Bayliss headed west and their fateful meeting with B.O. Holtermann. 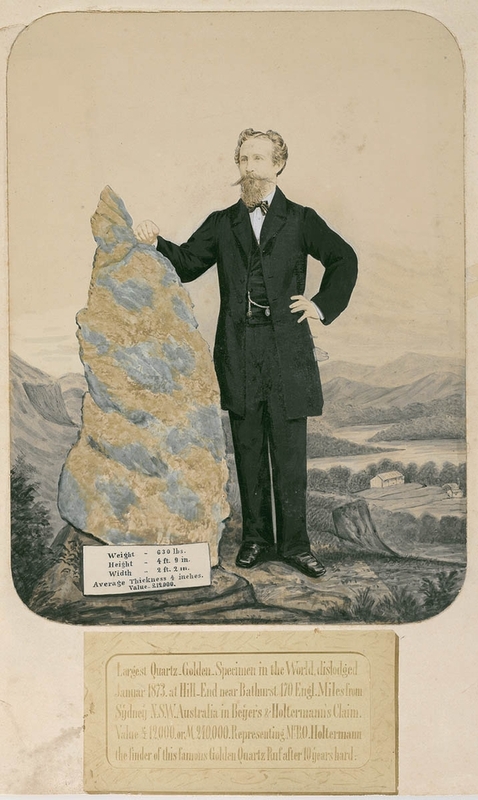 It was Holtermann’s intention to produce a photographic record of the gold mining areas of New South Wales and Victoria to attract other miners to share the good fortune he had found in Australia – a land of opportunity and his new homeland. Hiring Merlin and Bayliss was just the start. Holtermann built a studio for the A&A Photographic Co. in Hill End and the men also made photographic excursions to surrounding areas. The photographic process of the day was complex. It required photographers to coat each glass plate with a wet emulsion just before use and develop it immediately afterwards, before it lost sensitivity. When travelling, this meant taking a portable darkroom wherever they went. Despite the difficulty of this 'wet plate' process, the comprehensive goldfields photography of the A&A Photographic Co. has provided a unique documentation of frontier life. On 27 September 1873 Merlin died from pneumonia, leaving Bayliss the task in the following year of documenting the Victorian gold towns for Holtermann’s Exposition. Bayliss returned to Sydney in 1875 where he began making giant panoramas of the city from Holtermann’s house in North Sydney, resulting in the production of the world’s largest wet-plate negatives and several large panoramas including one, measuring 10 metres long, which astonished audiences overseas – winning a Bronze medal at the 1876 Philadelphia Centennial Exhibition and a Silver at the 1878 Paris Exposition Universelle Internationale. Only a small percentage of the A&A Photographic Company’s output has survived; about 3,500 small format wet plates negatives plus the world’s largest wet plate negatives. The story of how the collection was found and donated to the Library, some 80 years after its creation, is a tribute to photography historian Keast Bourke, who traced the remaining negatives to a garden shed in Chatswood belonging to Holtermann’s descendants. In 2011-2012 the negatives were cleaned, rehoused and rescanned as part of a digitisation project and are available online for all to enjoy. You can find more information on the Holtermann collection in our Manuscripts & Pictures catalogue. The world’s largest glass plate negatives of Sydney Harbour just been added to International Memory of the World Register.